This evening I made a quick and delicious meal with the pound of fresh raw shrimp that I had in the fridge. I decided to make Easy Shrimp Piccata. I also had a large head of fresh cauliflower in the fridge that needed to be used. 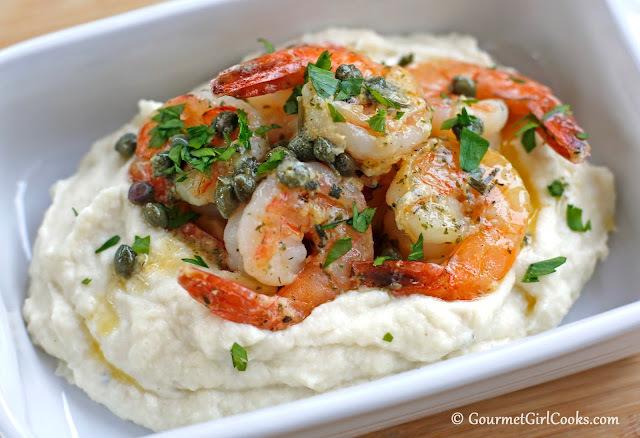 I thought about serving the Shrimp Piccata over zoodles, but decided instead to make my Rich & Thick Parmesan Cauliflower Mash to serve the shrimp over (sort of a grain free version of shrimp and grits I suppose...LOL). The garlic and fresh lemon herb butter sauce that the shrimp is cooked in went unbelievably well with the thick, rich Parmesan flavored cauliflower mash. The Easy Shrimp Piccata only took about 10 minutes to make and it was absolutely amazing. 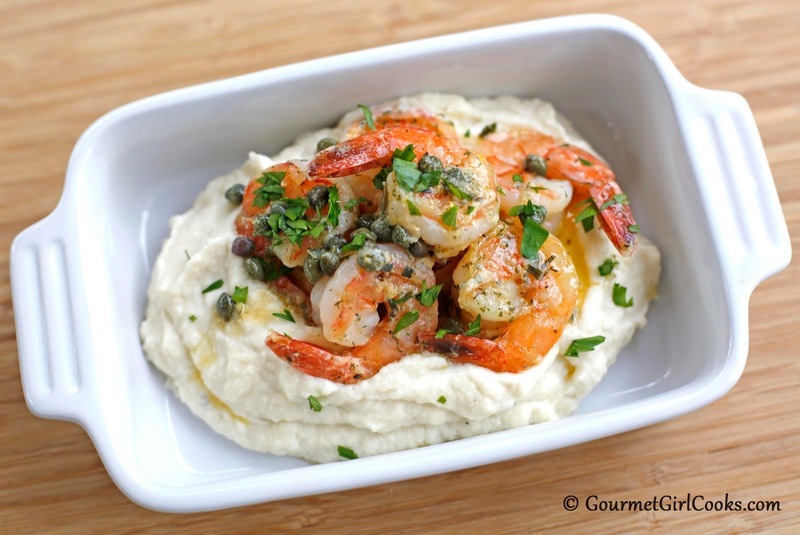 I snapped a few photos below as well as included the simple recipe for the Easy Shrimp Piccata. The recipe for the cauliflower mash can be found here: Rich Parmesan Cauliflower Mash. Enjoy! In a large nonstick skillet, heat butter over medium-high heat. When butter just begins to sizzle, add shrimp and cook, stirring frequently until shrimp turns pink, about 3 to 4 minutes. Add lemon zest, lemon juice and capers. Season with salt and pepper, to taste. Cook an additional 1 to 2 minutes. Serve over Parmesan Cauliflower Mash or zoodles. *Note: If Kerrygold Garlic & Herb Butter is not available, saute 1 clove of minced garlic in 3 to 4 tablespoons regular butter until tender, about 2 to 3 minutes; stir in 1 teaspoon finely chopped fresh parsley. Add shrimp and cook according to the recipe directions above. Your shrimp dish looks wonderful! Our local grocery store carries beautiful Gulf shrimp. Perfect for this recipe. Still haven't come across any Copper River Red, but haven't had a chance to get to the most likely stores yet this week ... hopefully this Sunday! Looks delicious and so easy to do! I'll be trying this out as soon as I buy some shrimp. This looks wonderful. I have frozen raw shrimp on hand. I'm assuming I'd just cook a little bit longer. 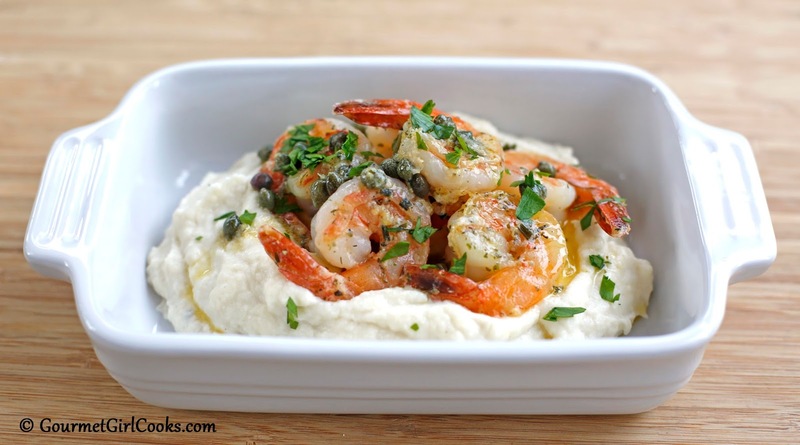 Have you ever substituted frozen shrimp? Thanks! Great dish. Just finished dinner. So delicious. Loved the califlower mash. Next time I will use some garlic and sour cream, just as used to do for my mashed potatoes. Your recipes are awsome and healthy. Thank you.